China’s influence in East Africa is fueling an upsurge in elephant poaching, gunrunning, and corruption according to a report on U.K. television Friday. A Channel 4 reporter spoke to people in villages and cities, wildlife managers, rangers, government officials, and illegal ivory sellers in Kenya and Tanzania—all of whom said China is the main buyer of banned ivory. Filmed secretly, sellers told the journalist from Unreported World that during a presidential visit from Chinese Communist Party leader Hu Jintao in 2009, two hundred kilos of ivory was bought by Chinese diplomats and taken out of Tanzania. The sellers did not say if Hu knew of the trade, but did say that a prominent diplomat from the Chinese Embassy frequently bought large amounts of ivory from them. Kooky Gorman owns a wildlife park in Kenya. Accompanied by armed rangers, she took the reporter to many spots in her park, where elephant carcasses rotted, their heads split open to make it easy to saw the tusks off. Many hides showed multiple bullet holes. The lead ranger said the killers had used AK47 automatic weapons to spray herds. The shootings were indiscriminate, killing young and old. Gorman said the weapons were bought from neighboring Somalia where the civil war has continued since 1991. The intensity of the poaching has been increasing for the past two years. In 2007 six elephants were poached from her park. In 2008, twenty-eight were poached. Fifty-seven were poached in 2009. She says there is a threat of elephant extinction. The Kenya Wildlife Service has strong rooms full of tusks and carved ivory taken during raids and confiscated at Nairobi airport. It has about 65 tons to 70 tons estimated at $10 million. Convention on International Trade in Endangered Species of Wild Fauna and Flora (CITES) authorities recently rejected Zambia and Tanzania’s request to hold a one-off sale for their ivory stockpile, valued of approximately $15 million. Since trade in ivory was stopped in 1989, some countries have been allowed to do a small amount of business in ivory if they have good conservation measures. Zambia and Tanzania are currently prohibited from any trade in ivory. The CITES annual meeting in Doha disregarded arguments that the sale could help police wildlife parks and stop the burden of protecting the horde of ivory. Selous Game Reserve in Tanzania has 40,000 elephants. On the TV program, a police informant who lived nearby in a village known for its illegal ivory deals said armed groups of 30 often came from Dara Salam in Senegal to take back ivory in 440-to-660-pound batches. The informant, whose face was not shown for fear of reprisals, had had his house burned down recently. He said he thinks movers are coming from China and the Far East to take bones and that they are in collusion with local authorities. 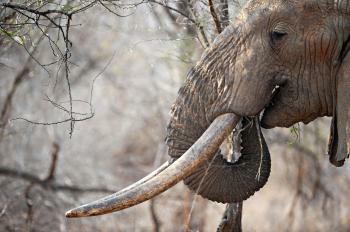 There is a small industry carving the poached ivory for the East Asian trade. “Many people from China come and buy,” he said. There is a market for trinkets, seals, and chopsticks. Chinese regime officials told Unreported World that they are against the illegal ivory trade and that Chinese diplomats did not illegally purchase or export ivory by misusing diplomatic immunity in 2009. Most villagers have stood by while violence around the poaching continues. They felt threatened and were unable to prevent the elephant deaths. Now, many see tourism as the main way they can earn a living, so they are protecting the animals and habitat as much as they can. EPA and DOE have announced the creation of the State Energy Efficiency (SEE) Action Network.